Why yes, that word in the upper left corner does say what you think it does. Why would a father share such a thing? Duh, because I’m proud! Read on and find out why. A common misconception about people with autism is they lack empathy for others. It’s a myth that’s largely been debunked over the past several years but such progress was in no part thanks to my daughter Skylar, who spent the first 10 years and 4 months of her life bringing this stereotype to an entirely different level. Skylar, you see, not only didn’t empathize with the misfortune of others–she reveled in them. Crying, yelling, or misbehavior by another child, for whatever reason, has always caused my older daughter to laugh hysterically. I never believed this awful trait to be anything but a non-malicious aspect of her autism but, nonetheless, try explaining that to the injured child she’s laughing at in the heat of the moment…or their irate, panicking parent…or her heartbroken little sister Alyssa. I’ve long believed the only thing an autism parent can do in such situations is to (often uselessly—but it’s for show) admonish their child while apologizing profusely to all who will listen. Generally, such apologizes were accepted and life went on…until Skylar did it again. People who knew her accepted her twisted laughter at the worst possible times as part of her one-of-a-kind package and even grew to find it darkly humorous. I appreciated their appreciation of Skylar but such moments tore me apart because they served as proof my little girl was never going to connect with the human race: How could she with no sense of empathy? The one saving grace was that the twisted laughing was infrequent because Skylar ran with a crowd whereby she was usually the one having difficulty (not nearly as comical to her). It all changed this school year. 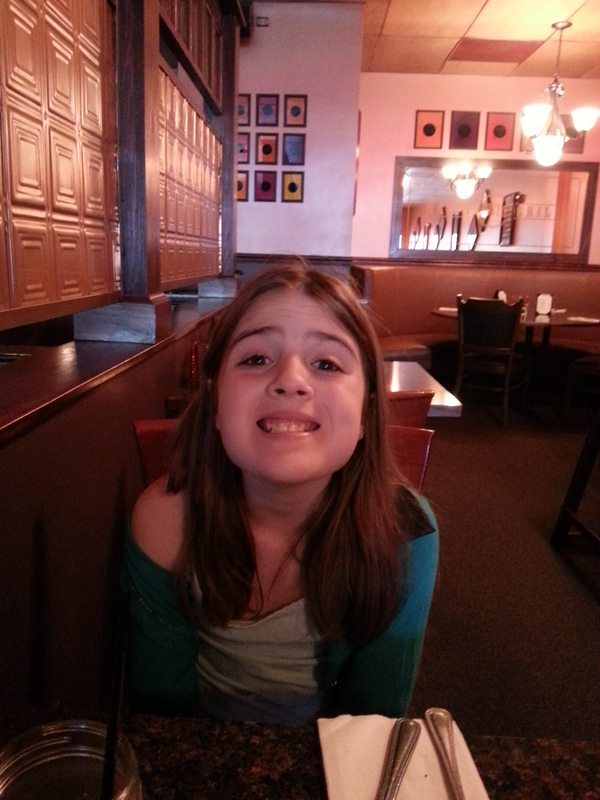 As previously chronicled in this space, we made the decision to tap out on full inclusion for fourth grade and placed Skylar in a sub-separate room with other kids on the autism spectrum for the vast majority of her day. Since it wasn’t exactly a leap to assume the kids in said classroom were likely to frequently display the crying, yelling, and misbehavior Skylar so enjoyed, I feared we were taking a problematic-but-infrequent behavior and making it a staple of her existence. For the first few months of the school year, my fears were warranted. Skylar came home beaming with stories of how this kid or that kid in class did this wrong or cried about that. I knew a day of laughter at the expense of others had just transpired. Her connectivity was growing weaker and her sense of empathy for others not at all. I felt more hopeless than ever about her ability to fully join this world. A few months ago, I suddenly noticed that Skylar was no longer as bemused by her classmates’ struggles. When I asked her about school, she would say very little, and, when I’d ask about this kid or that kid, she’d become silent instead of giggling uncontrollably. What was going on!? When I asked her teacher about this drastic tone change, I found out Skylar had some concerns about a classmate possibly ending up in jail someday because of their bad behavior and was trying to help them. She also now grew demonstrably upset in class when they or anyone else was upset or struggling. Wait…what!? Skylar cared about the kids in her class? Skylar also began to react to Alyssa’s occasional outbursts in a radically different fashion. Moments of legitimate hurt on Alyssa’s part were met with Skylar singing the song “Safe and Sound” to soothe her and crying or protesting in unison, which was great to see. Of course, drama queen moments on Alyssa’s part were met the same way, which wasn’t so great but at least gave my younger daughter some perspective as to how silly she looked in such moments. EmoSkylar, as we dubbed her, had arrived. Skylar has always fancied herself a clinician so when I learned she’d made a behavior chart for the classmate she’d taken under her wing in an effort to cut down on their use of “unexpectible words”, I wasn’t surprised. What did surprise me was when I found one of the charts she’d made at home one day posing the question, “Who’s Fuc#@R”, words her classmate had presumably uttered. EmoSkylar was working blue and I was concerned. Sure, her heart was in the right place but it was difficult to regard a 10-year-old writing F-bombs in her spare time as a positive. Exactly what direction was this newfound sense of empathy for others taking her? That evening, our family went out to dinner. Alyssa had asked for a few ridiculous things while we awaited our food and pouted when they were denied (causing EmoSkylar to come to her defense, naturally). When my wife Jen and I both played on our phones a few minutes later, Alyssa decided to dig through her Mom’s purse…causing Skylar’s eyes to grow wide. In one quick motion, the big sister who is usually more of a little sister did a very big sisterly thing: She reached over and removed a lighter from Alyssa’s hands before any trouble or injury could occur. By the time I caught on to what had happened, the potentially flammable situation had been vanquished—by Skylar! Forget just empathy–Skylar was now responsible! EmoSkylar continues to flourish as the school year draws to a close. She’s not only dispelling any myths of people with autism not having empathy, she may also be contributing to a new one whereby people on the spectrum are regarded as too wrapped up in the feelings of others to sometimes function. Admittedly, EmoSkylar can be annoying at times but such melodrama beats the hell out of her laughing at kids who are crying. Who’s F%$#@R? I don’t give a S#%, to be honest, because, in the year 2014, my Skylar is putting out fires—figuratively and almost literally—and helping others instead of laughing at them. Not only can she connect—she can be a vital link. Skylar is a little girl with multiple identities, “Snow” being the most recent. 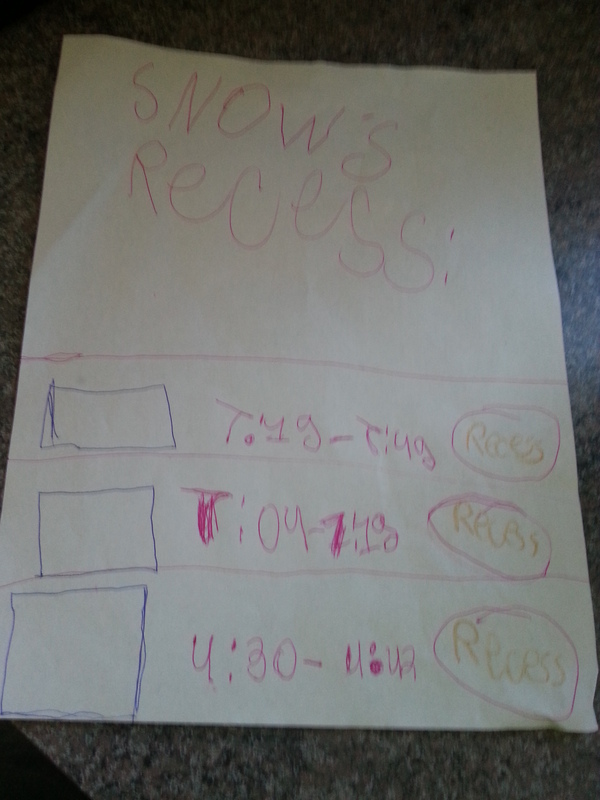 But “Snow” has taken well to suggestions to keep swears off her behavior charts, as evidenced by this simple recess plan she has for the kids in her class. LOL! And the only thing odder than being proud of something like your daughter’s Fbomb is being congratulated for it! ( by someone who knows just what your are talking about!) Congratulations!!! Thanks for reading, Joanne! Yes, I agree. Self-absorption is pervasive across society. Excellent! Quite frankly Sean, I’m realizing often how lacking empathy is for the average out there. Most folks tend to be “self obsessed”. It is all about “them and theirs” all the time. I see so many instances of this in ever so many ways. Sympathy and Empathy are two different things. People with Autism do have deficits in empathy, oftentimes, very large deficits. However, this has nothing to do with sympathy. Sympathy is caring for others. Empathy is sharing the feelings of others. A person with Autism can very well be very sympathetic, but the key is that knowledge of the state of others must be obtained. Sometimes, due to non-verbal communication issues, or because other people frequently lie about their own feelings, obtaining this knowledge is difficult. Other times, expression of one’s concern can be difficult. But, people with Autism do not have deficits in sympathy that I have ever noticed, although empathy may indeed be lacking. Thanks for reading, Joseph, and also for your excellent perspective! Yes, sympathy and empathy are different. When I started writing this, I actually was using both words but it didn’t flow so I kept it to empathy, which better encompasses the theme of her demonstrating increased awareness of others rather than as just props for comedy. In terms of my daughter, I never thought she lacked sympathy but her expression of it was understandably offensive to others. I see you have a blog too and I look forward to checking it out.